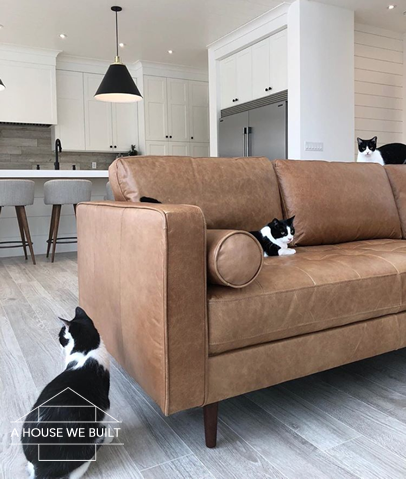 One of the most common questions I got on our Instagram page right after we showed our new leather couches was “How do you keep the cats from scratching the leather sofas? !” and I’m no expert but these are some steps we’ve taken to help prevent damage. I keep the cats’ nails trimmed weekly Pro tip: if you do it while they’re sleeping they don’t even notice. I use a nail clutter similar to this one (Amazon) and a tip I have is that when they’re awake and snuggling with you make a point to very gently handle their paws. Be super gentle and soothing about it but this way they’ll get used to you touching their paws and when you go to cut their nails while they’re sleeping it doesn’t bother them. I use a lot of verbal cues. Contrary to popular belief, cats *are* trainable. They’re just stubborn. But if you’re consistent and firm but gentle with your verbal cues, they do learn. When introducing anything new and special (like our couches), I always try to have something else in the room that is even more attractive to the cats. In our case, I kept some of the fabric wrapping the couches came in pooled on the floor and the cats were way more interested in that. I consciously choose leather that looked “worn” so that it would weather well over time and wouldn’t show scratches as much just in case. Also anytime they may accidentally scratch the leather, I use this leather conditioner (Amazon) and put a little on a clean towel and rub it into the spot and it practically removes it (especially after a few coats). Be sure you test any conditioner first in an unseen area to be sure it works with your couch. I also fully condition the couches every couple months with the same conditioner (Amazon). Finally, when we first moved in, we use a spare bedroom as a “cat room” where we let them acclimatize to our house so they wouldn’t get overwhelmed. I still put them away there at night because they love that room (it’s a kitty haven!) so I don’t worry what they’re sinking their little claws into at night. And if you don’t have cats, please just enjoy the cute picture instead!